The main difference between amino acids and fatty acids is that the amino acids are the building blocks of proteins whereas the three fatty acids bound to a glycerol and form a triglyceride, which is the main constituent of fat. Furthermore, the R group of amino acids can contain atoms other than carbon and hydrogen while the R group of fatty acids only contains carbon and hydrogen atoms. Amino acids and fatty acids are two types of building blocks of macromolecules of the body. Amino acids are the building blocks of proteins. Generally, twenty amino acids are involved in the production of proteins. They are called the universal amino acids. All amino acids are made up of a hydrogen atom (H), a carboxylic acid group (-COOH), an amine group (-NH2), and a variable side chain (R) arranged around a central carbon atom, which is an alpha carbon. Therefore, the variability of physical and chemical properties of an amino acid totally depends on the properties of the R group. Amino acids are classified into two groups based on the ability of the body to make them. Essential amino acids cannot be synthesized by the body. There are nine essential amino acids: alanine, asparagine, aspartic acid, cysteine, glutamic acid, glutamine, glycine, proline, and serine. These amino acids have to be included in the diet. The rest of the amino acids are produced in the body via various biochemical pathways and they are called the non-essential amino acids. Fatty acids are the long hydrocarbon chains with a terminal carboxylic acid group. Three fatty acids individually form ester bonds with a glycerol molecule to form a triglyceride molecule, which is the main constituent of most of the fat on both animals and plants. Due to the presence of a long hydrocarbon chain, fatty acids are considered as non-polar molecules. Most fatty acids can be produced by the body. But, the two fatty acids linoleic acid and alpha-linoleic acid cannot be produced by the body; hence, they are considered as essential fatty acids. Fatty acids can be classified into two based on the saturation of the hydrocarbon chain. 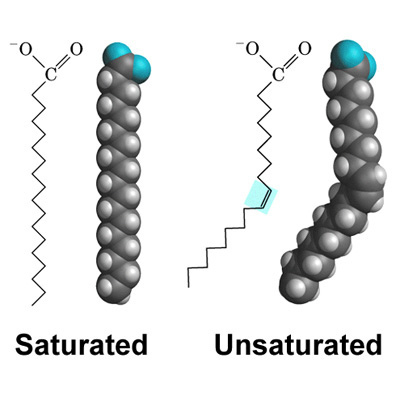 In saturated fatty acids, each carbon of the hydrocarbon chain is joined to the adjacent carbon by a single bond. In unsaturated fatty acids, the hydrocarbon chain consists of one or several double bonds. Based on the distribution of atoms around the double bond, unsaturated fatty acids are classified into two: cis and trans fatty acids. Cis-fatty acids are the liquid fats while the trans-fatty acids are the solid fats. Amino acids and fatty acids are two types of small metabolites of the body. They are formed by the digestion of food. Some amino acids and fatty acids can be produced by the body. Also, both of them contain a carboxylic acid group. In addition, both are involved in the formation of macromolecules. An amino acid refers to a simple organic compound containing both a carboxyl (—COOH) and an amino (—NH2) group while a fatty acid refers to a carboxylic acid consisting of a hydrocarbon chain and a terminal carboxyl group, especially any of those occurring as esters in fats and oils. This explains the basic difference between amino acids and fatty acids. The structural difference between amino acids and fatty acids is that while an amino acid is made up of a hydrogen atom, a carboxylic acid group, an amine group, and an R group arranged around a central carbon atom, a fatty acid is made up of a hydrocarbon chain attached to a terminal carboxylic group. 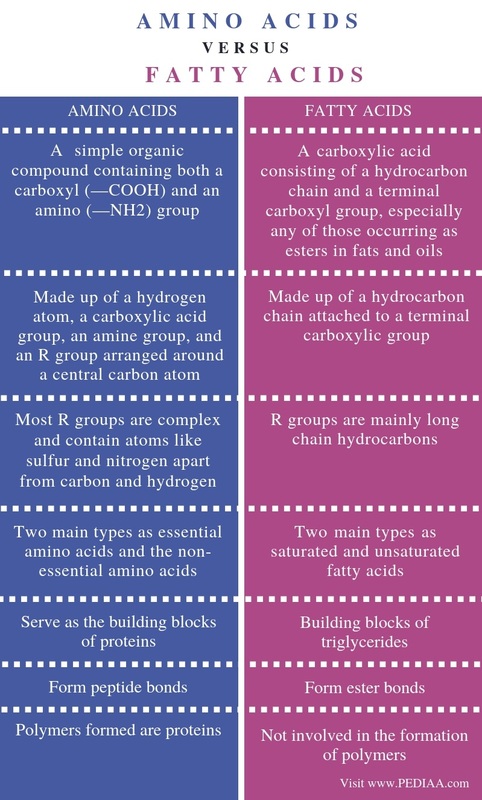 Furthermore, most R groups of amino acids are complex and contain atoms like sulfur and nitrogen apart from carbon and hydrogen while the R groups of fatty acids are mainly long chain hydrocarbons. This is another difference between amino acids and fatty acids. Also, one other difference between amino acids and fatty acids is that the amino acids form peptide bonds while the fatty acids form ester bonds. In addition, the polymers formed by amino acids are proteins while fatty acids are not involved in the formation of polymers. The two main types of amino acids are the essential amino acids and the non-essential amino acids while the two main types of fatty acids are saturated and unsaturated fatty acids. Their role also contributes to another difference between amino acids and fatty acids. The amino acids serve as the building blocks of proteins while fatty acids are the building blocks of triglycerides. Amino acids are the building blocks of proteins while fatty acids form triglycerides. 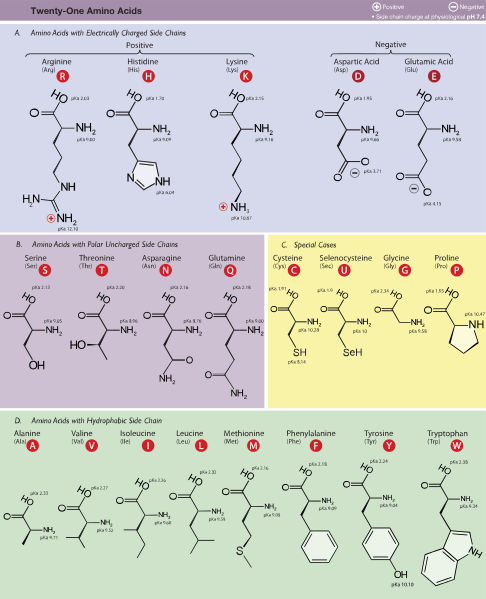 Amino acids are complex molecule due to the presence of complex structures in their R group. The R group of fatty acids is completely made up of carbon and hydrogen atoms. The main difference between amino acids and fatty acids is their structure and role in the body.